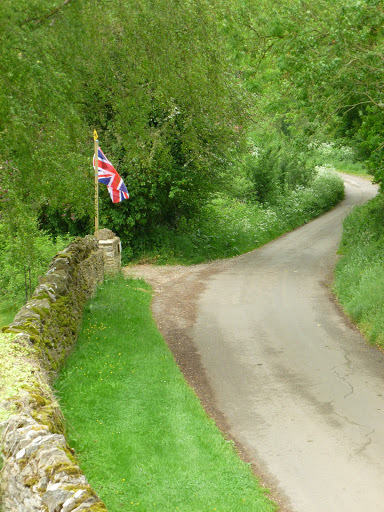 Back in March of last year I decided to run an informal monthly survey of the hedgerow that follows the line of the little country lane that runs past our cottage in the secret valley. Parts of the lane are an ancient ‘green’ road and so would have once been busy with drovers herding their sheep and cattle to market. There are only two houses in our part of the valley and the other is reputed to be an old drovers’ inn. Our place was built a lot more recently in the 1850’s so may just have witnessed the passing of the tradition as livestock began to travel along the more direct and newly created turnpikes. It was also necessary for the secret valley to have a more direct route to the turnpike and a new road was built that went past the little winding river in the header photo above. Where it joined the turnpike it was marked by a white gate and even though it was removed a hundred years or more ago we still talk of turning left or right ‘by the white gate’. This is rather confusing to those unaware of the history behind the expression – it took me two years before I found out why I could never see it! 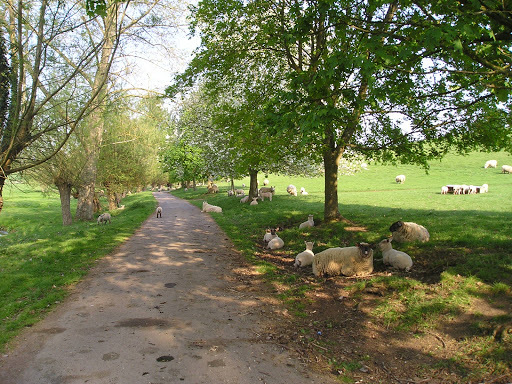 In the decades that followed the ‘old road’, as it is now known, became disused and is now part of the footpath and bridleway networks used by walkers and horse riders. Drove roads can be very ancient indeed and they were often marked by hedgerows to provide shelter and food and to prevent stock from straying. These were often linear strips of the original wildwood left after the remainder of the trees had been clear felled – in our case, the Wychwood Forest. As a result, the wild flowers associated with these ancient woodlands have survived nestling in the hedgerow bottom giving a good indication of their history. So sensitive are these plants to change that it is possible to follow the line of the original road by the flora growing alongside it. 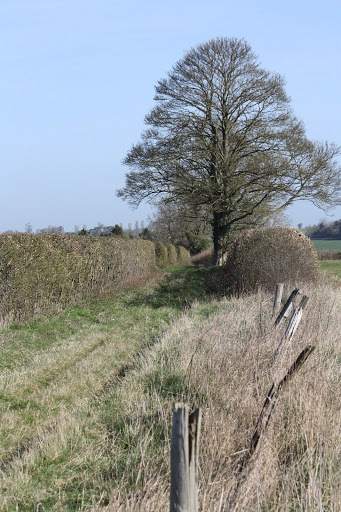 Although the newer parts of our lane – now probably two hundred years old – are also lined with hedges of equal stature, the plants have yet to colonise. 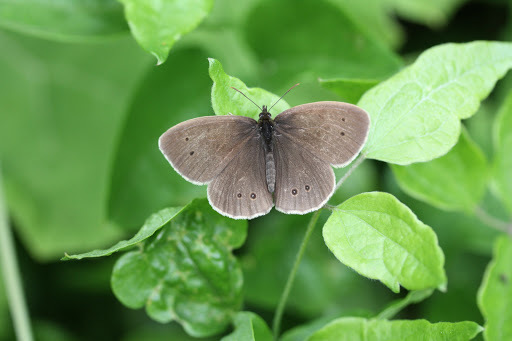 To record these changes was the initial idea behind my hedgerow project. Like all plans, it didn’t quite work out. In my first and only blog post about the project, I described March as being warm and dry; in fact it was hotter than normal and then turned out to be the hottest month of the year. In April, the weather turned cooler and, on the day that drought was officially declared, it began to rain until the year was declared the wettest ever recorded. 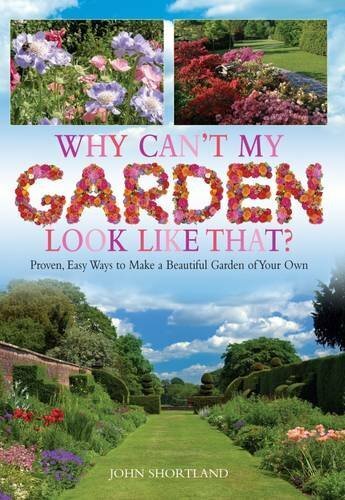 This coupled with other commitments and the commissioning of my book on gardening meant the idea was abandoned to be resurrected this year. That hasn’t gone quite to plan either! So rather than set myself the unrealistic target of recording on a specific day of each month, I shall satisfy myself with just taking photographs when I either have the time or feel in the mood. Not scientific, I know – and certainly not disciplined – but the pleasure I get from walking along the lane every day is not just because of the plants I see. For me, it is knowing that I’m following an ancient track that has been trodden by countless generations of hard working countrymen. Some of the trees I pass are the same as when they walked by; the secret valley still echoes to the sounds of sheep and cattle and the little winding river waters them and refreshes sore, tired feet on a hot, summer’s day. 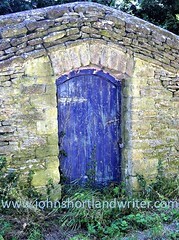 It is twelve years since I came to the secret valley and it is still releasing its secrets. How many times have I walked along a sunken track above the house to a rough patch of uncultivated land? Now recently learnt, I know it is the site of a Bronze Age settlement and the thought that this special place has been home to us lucky few for three thousand years or more is a humbling and joyous experience. To view the original post from March 2012, click here. I never did get to see the fritillary fields of Oxford and the Upper Thames. Perhaps next year. If fritillaries are the flowers of the lowlands (albeit rare) then it has to be the cowslip that can lay claim to the title for the hills of the Cotswolds. These little, short stemmed wild primulas (Primula veris) have a simple beauty – they look good growing in the garden but even better in the fields and hedgerows where they belong. 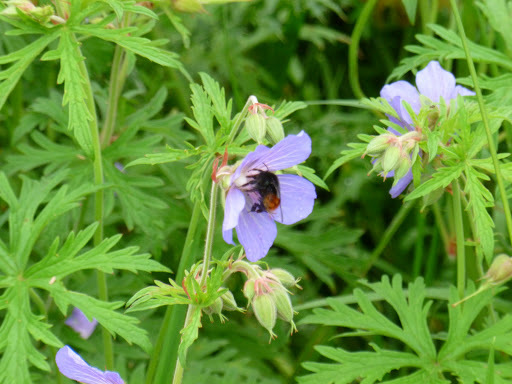 Cowlsips grow in plenty in the secret valley and I have noticed this year that they abound along the old drovers road, as do bluebells – don’t they look good growing in combination? Is this because these green lanes are never sprayed with chemicals and the thick hedgerows that line them prevent any spray drift from reaching? The field below is at the top of the secret valley and is a haven for wild flowers – soon there will be orchids showing. 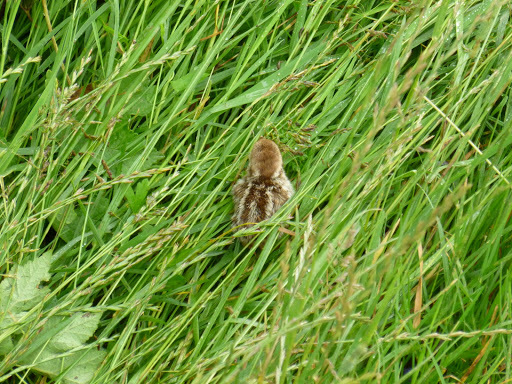 The farmer likes to see them so has never tried to ‘improve’ the ground in the agricultural sense and, as a consequence, the field is also full of birds and bees and butterflies. However, to see the truly stunning cowslip meadows, you have to travel out of the secret valley. Just a few miles up the road is this field where the cowslips grow in the tens of thousands, so dense that it is impossible to walk without trampling several plants at once. Few people see them as they are ‘off the beaten track’ which is a pity in some respects, for they should be enjoyed and marvelled over. The scent of cowslips is subtle but, when growing in these huge numbers, it wafts over in waves on gentle, warm breezes, a heady mix of hay and honey. This gives cowslip wine, a traditional drink, its characteristic taste and potency. Made from many hundreds of flower heads it is now rarely made as, fortunately, most people now understand the importance of preserving our native flora and fauna. This has benefitted the cowslips, which were once quite an uncommon sight, as they are left to multiply with these spectacular results. At Last! Signs of Spring! The secret valley is at last bursting into life, albeit rather late. Or perhaps, this is how the season should be as we have had such mild winters the past few years. Whichever, the last few days have been warm and sunny, although the wind has been on the keen side at times. The result is greenery beginning to appear in the hedgerows and on the trees and what a welcome sight it is. Today I decided to walk along the ‘old’ road, a drover’s route that was the original way to enter the secret valley before the present road was created, probably in the late 18th century. This route is now a wide grassy path – a subject of a post to come shortly. The photo above shows how advanced the Spindle bushes are compared to some of the other hedgerow shrubs. The hawthorn beyond it is still quite dormant yet, some years, they can start to leaf up during February. Hawthorn seems especially prone to variation as some of them elsewhere in the secret valley are quite green with new leaves. The Wayfaring Tree, Viburnum lantana, below (which never reaches tree like proportions) also looks lifeless from a distance. However, that is because its leaves and flower buds are greyish when first opening, being covered in felt like hairs , botanically referred to as tomentosum. The photograph beneath the Wayfarer is not of the same plant but the opening buds of the Whitebeam, Sorbus aria. They are not related: Viburnums belong to the honeysuckle family and Sorbus to roses. The Whitebeam makes a fine tree and although it is native, it is often planted in gardens. It will be sometime before the Ash trees open their leaves but their black nobbly buds, that look so hard and devoid of life, quite suddenly have burst into little pom-pom flowers. All they need now is a group of cheerleaders to use them in their routine: it would certainly aid pollination! Why should this group of Cherry Plum be in full flower when other trees are not in leaf? I have no idea but am just grateful to be able to enjoy some of the first blossoms of the year. I’ve had to wait a long time to see this, this year. 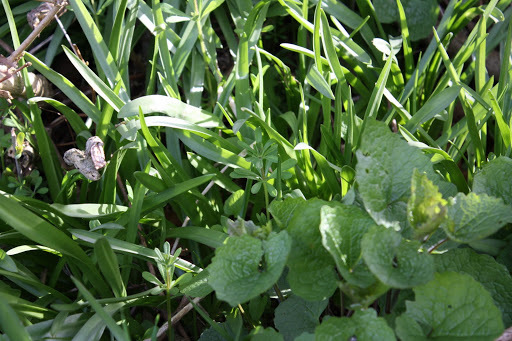 The wild flowers also show both signs of the winter and also spring life. Cow Parsley or ‘Keck’, as it is known locally around here, is sending up its young leaves which clearly show the reason for the ‘parsley’ in its name. Where ‘Keck’ originates from, I have no idea, for I have not come across that name when I lived in the Chiltern Hills just 50 miles away. Local plant names can be very confusing and make an interesting study in itself. Despite its lushness, Cow Parsley is poisonous. Later, in the summer, it will send up tall spikes of flat, white flowerheads made up of dozens of tiny stars. These dessicate to remain standing through the winter and, surprisingly, there are still a few that have survived the snow. They have a special beauty when the sun catches their metallic, bronzed skeletons. 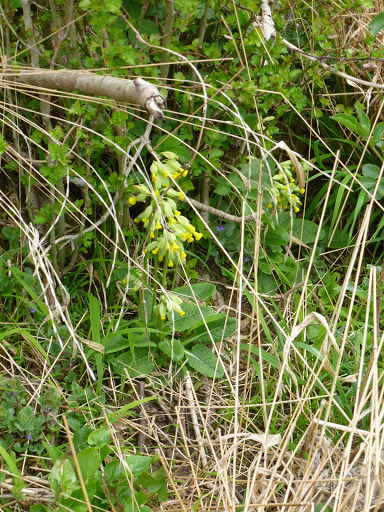 Cowslips, Bluebells and the Hedge Mustard (which in the Chilterns, we called Jack-by-the-hedge) are all showing signs of things to come. 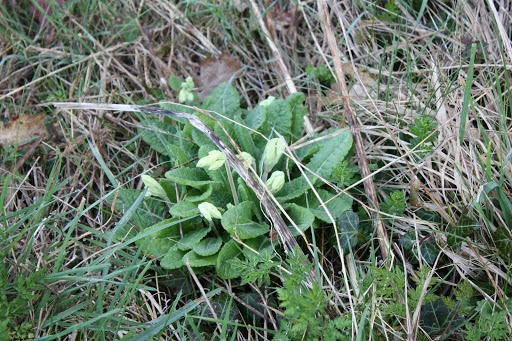 The cowslips show their flower buds and, normally, bluebells would be doing so too. In the bottom photograph, the Jack-by-the-hedge has leaves reminiscent of the garden plant, Honesty. These leaves have quite a mild garlic smell when crushed and make a good addition to spring salads when they are young and tender. The little spikes of six to eight small leaves in whorls are the dreaded Goosegrass (or Cleavers, depending where you live). 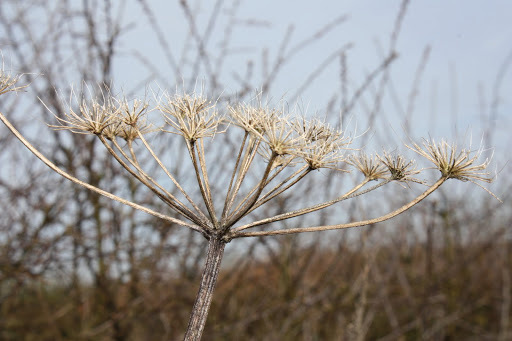 Before long, these will have scrambled five or more feet over every plant in the hedgerow and the garden, their leaves and bobbly, pinhead seeds sticking to every bit of clothing – the gardener’s curse. One of the joys of going away is the pleasure of returning home. 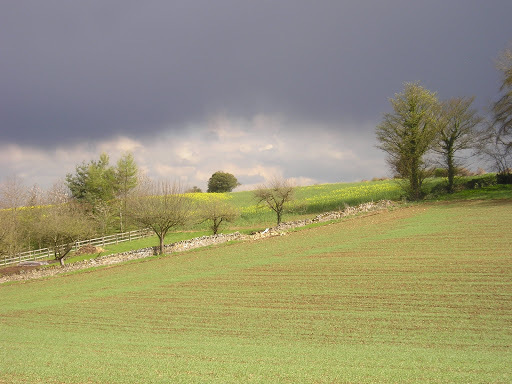 The main road that cuts across our bit of the Cotswolds follows the ridge of the hill, which gives the appearance of being plateau like. There are few hints that just a little way off to the side is the secret valley and the little lane leading to it gives few hints either. To call it an avenue would be rather pretentious, but the roadside plantings of beech and cherry create the first thought that you may be going somewhere rather special. And as you begin to pass beneath their canopy, the hills start to rise on either side. These are rarely, if ever, treated with any chemicals and wild flowers, including orchids, abound. But there is still no hint of our little, winding river. Then, as the avenue ends and on a sharp bend there it is! The first glimpse is of the old sheepwash, where the river was widened and deepened although still almost jumpable, for everything about the secret valley is miniature: the hills, the river, the road. Beyond the sheepwash come the meanders – the photo of these snake like bends are in the blog’s header title. Our little stone cottage lies further along the road – and this is now the original old drove road, for the one that we have travelled so far has probably only been in place since about the late 1700’s. More of the drover’s in another post. Below is the view from the house looking back towards the meanders – we may only have just one other house nearby but there are dozens of sheep for neighbours! And tucked away beyond the bridges are the remains of the old mill workings. The culvert is barely noticeable until the river levels rise and the water diverts towards the mill. We’ll travel there another day.